God I know You healed me, but I still have the scars. I know You delivered me, but what if it shows up again? I know You spared my life, but for what purpose? You know, church folk talk a good game, but what happens when the mics are turned off and the audience has gone home? What do you do when your picture perfect image is shattered? No one wants to really talk about the “what if” questions that push against the faith sermons we preach. 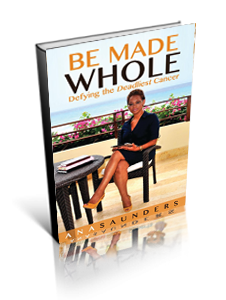 In Be Made Whole, Ana Saunders identifies the deadliest cancer of them all; the kind that can’t be detected through labs, blood or biopsies. The cancer called FEAR. On the heels of battling with weight, identity, and faith, adolescent Ana, church-going Ana, and faith-filled Ana found herself face to face with devastation. Leukemia cells were found in her lab work. At the age of 15. Her aunt, at age 20, died of cancer. Her cousin, at age 9, died of cancer. Both her grandfather and grandmother died of cancer. And yet, Ana was miraculously healed. Be Made Whole moves beyond the easy answers. It travels to the deep places where our questions remain unsettled but our faith is affirmed. If fear has ever been a cancer to you, then this book is for you. In the end, every reader will know what it truly means to be made whole… in God.